Tired of the crowded beaches every summer? Weary of the long hassles of poring througha long list of beach resorts? Fancying an uncommon vacation getaway? 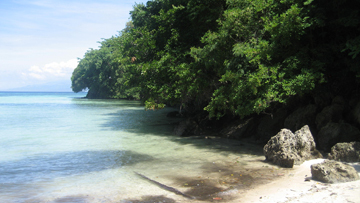 Look no further than the white sand beaches of Glan, Sarangani. 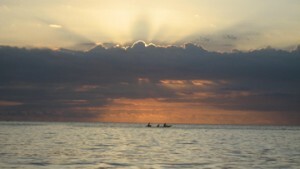 A few weeks ago, my friends and I had the rare chance of spending a weekend in one of the beaches in Glan, Sarangani. There were some secluded vacation spots here and there, but we chose a place where there were no establishments. We set up camp near a small and sparsely populated fishing village, since one of my friends has some friends there. Green vegetation surrounded us. Coconuts, trees, shrubs, unique flowers never before seen all added to the beauty of the place. White sand beach riddled with rocky hills were in both sides of our camp. The waves were gently washing up on the shore while the cool sea breeze whirled around us. 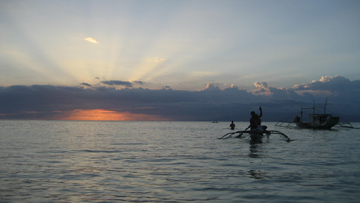 Best part of all is the beautiful Sarangani Bay would always display a magnificent sunset. 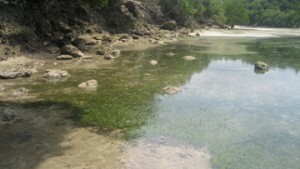 Unlike those beach vacations spots frequented by most people, our spot in Glan was without tourists. That only added to the mystery and “exclusive” feel of the place. If you want to go to a lovely, quiet place, I recommend going a trip down south. But if you’re not familiar with the place, you should definitely try checking in to one of the resorts. 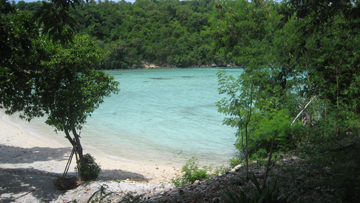 There are some resort scattered along the long, jagged coastlines of Glan. However, these resorts don’t have much tourists anyway, so you can still enjoy the beauty and tranquility of Glan, Sarangani. From General Santos City, take a van going to Sarangani (near KCC Mall) then from Sarangani, take a motorcycle going to Glan. You may want to go shopping for basic items in Sarangani or in General Santos City, since Glan is still a bit undeveloped. hi peter! can u give me an almost exact estimate of the fare from GenSan to Sarangani and Sarangani to Glan? my friends and i are planning to go there to enjoy the beach. pls. reply. tnx in advance. Very nice beach. 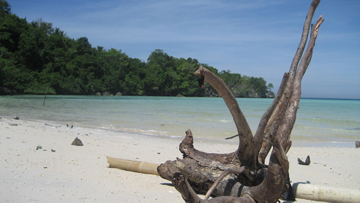 In Malaysia you should check out Pulau Sipadan which located at Sabah. I’m sure everyone will love it. Oh, really, thank you for telling us about Pulau Sipadan. nice place. and yes, Pulau Sipadan is worth visiting.